Consider this: Amy has been feeling anxious for some time and it's starting to have a negative impact on her life. She needs some help, but as she's never had therapy before has no idea where to start. Amy is struggling with anxiety, and added to that anxiety is the extra anxiety around finding a therapist that's right for her. How does she choose from the hundreds out there? 1. She talks with a friend about how she feels, and they say they saw a therapist who was great - they find the details and share them with their friend. So always give clients a few business cards, you never know when they might use them to refer to you - and take a look at how to make your business cards work for you. 2. She talks with a friend about how she feels, and the friend remembers seeing some details about a local therapist on social media that looked good. They tap on their phone and find you. Be visible, be seen and you will be remembered. Most people these days will fire up Google when they need something. Well, most people start at the top and move down, so it’s important to work on your SEO (Search Engine Optimisation). SEO is simply letting Google know what you do so you appear in relevant searches. This includes things like using the right keywords, naming your images correctly, writing a blog and keeping your website updated - Google will show up to date websites over stale ones. Now I know if you’re a technophobe the idea of SEO can be daunting, but you don’t have to be an expert, just a few simple tweaks can make a big difference (and blogging helps enormously too). You can find lots of information about improving SEO out there and I have some on my Pinterest board 'website and branding tips for counsellors' so pop over and take a look. Often, a Google search will bring up an online directory so if you're on one, check your bio: what will make you stand out in a sea of other therapists? Consider your bio from the viewpoint of a client, will they know what you can help with? Is your profile pic warm and welcoming? *Tip: get a none therapy friend you can trust to give you honest feedback on how appealing your profile is. People want to have an idea of who they are going to see. They feel vulnerable so a friendly or familiar face will help them, so make sure you have a photo on your website - this isn't the time to be shy. Although professionally produced photos are great and something to work towards, you certainly don’t need them. Get someone to take some pics for you, or take some yourself. When someone lands on your website, you have only have a few seconds to make an impression, so what impression will people get when they land on yours? Is it clear who you work with? Is the language easy to understand? If not, they will click on to the next one. A blog is the best way to demonstrate your knowledge to potential clients. It keeps your website current (which Google loves) and offers helpful ideas and tips. When looking for a therapist, having a well written, useful blog could be what makes Amy choose you over another counsellor. Until recently I ran the Lincoln Counsellors Network, and I remember clearly going through a long list of counsellors and ringing them to invite them to a meeting. I was shocked at how bad the process was! I’d ring, and just get no answer. Or I’d ring and get a generic ‘came with the answerphone’ message. Put yourself in the clients shoes - would it feel safe for you to leave your details not really knowing the right person will get them? 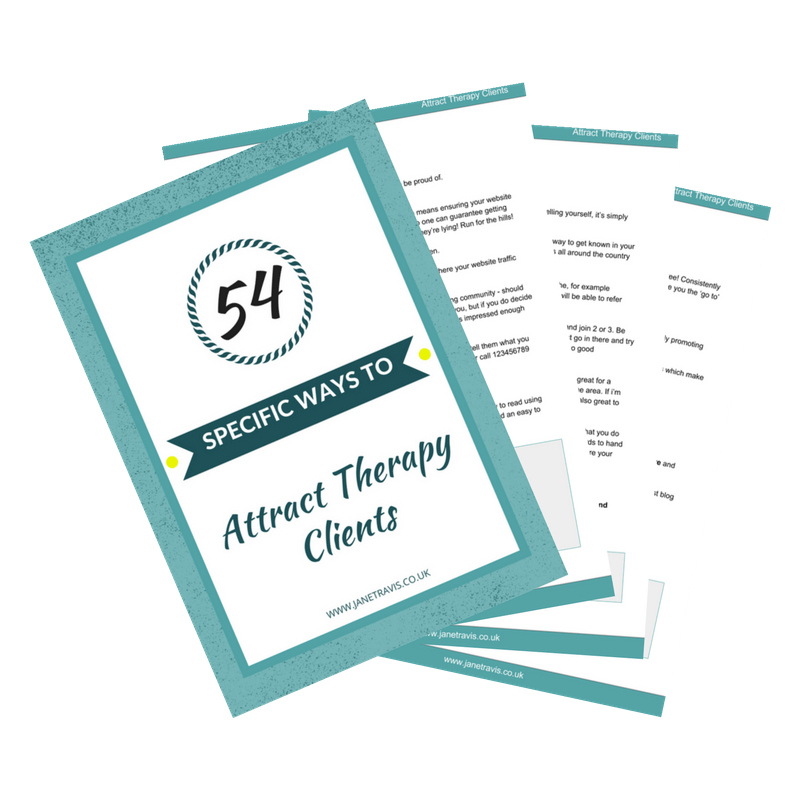 There are plenty of therapists out there, will clients just go to the next person on the list. Don't lose that client! Need help with your voicemail? Take a read for loads of ideas and never lose another client again Are you losing clients without even knowing it? People need to know practical aspects of coming to see you - things like costs, parking, public transport. Make it easy for people, because yes, you guessed it - if you don't, they will find someone that does! So there you are, 8 things to consider to either help clients choose you over others, or make the process easier for them. Are you making it hard for clients to choose you? What can you do to make it easier for potential clients? Takes steps now, and stop them moving on to the next person on the list. And if you're struggling to get noticed by clients, take a look >>HERE<< and see how I can help.